With a few high-quality ingredients and some patience, you can make classic beef jerky at home. Real beef jerky can and should be a delicious gourmet treat not the cheap, dried-out processed meat products sold at gas stations and grocery store checkout lines masquerading as jerky. When it comes to making homemade jerky, there are two primary factors that impact the jerky's texture: the meat fiber and moisture content. In this jerky recipe, brining not only tenderizes but also adds flavor to beef jerky. With a little patience and time, it is easy to customize your own beef jerky by making it at home. Place water, salt, molasses, garlic, Worcestershire sauce, and black pepper into a large, gallon-size ziptop bag. Seal and squish the contents until thoroughly combined. Place trimmed beef in the brine, squeeze out the air, and seal. Refrigerate for 12 hours or overnight. After marinating, remove steak and pat dry. Discard brine. Place steak on a tray and freeze for 30 to 45 minutes until ice crystals just begin to form. Meat should be firm, but not frozen solid. Slice into strips 1/4-inch thick. Season with your favorite spice rub. Follow dehydrator's manufacturer directions to dry until stiff, but still pliable (see Note below about oven-drying). When finished, jerky should be dry to the touch. Store in an airtight container in the refrigerator. Note: If you do not own or prefer not to use a dehydrator, this brined beef jerky also can be dried on racks over trays in the oven at the lowest possible setting with the oven door slightly open. What's great about this recipe is that it is highly customizable, and you can use just about any spice rub of your choice. But if you're new to making jerky or simply don't know where to start, you can always pick up a pre-mixed spice blend at the grocery store. If you do, just be wary of sodium content, as the brine in this recipe imparts quite a bit of salty goodness already. If you're wanting to go at the spice rub on your own, even plain old cracked black pepper is a tasty, classic choice. Beef jerky has been popular in the Americas since the time of the Inca Empire. 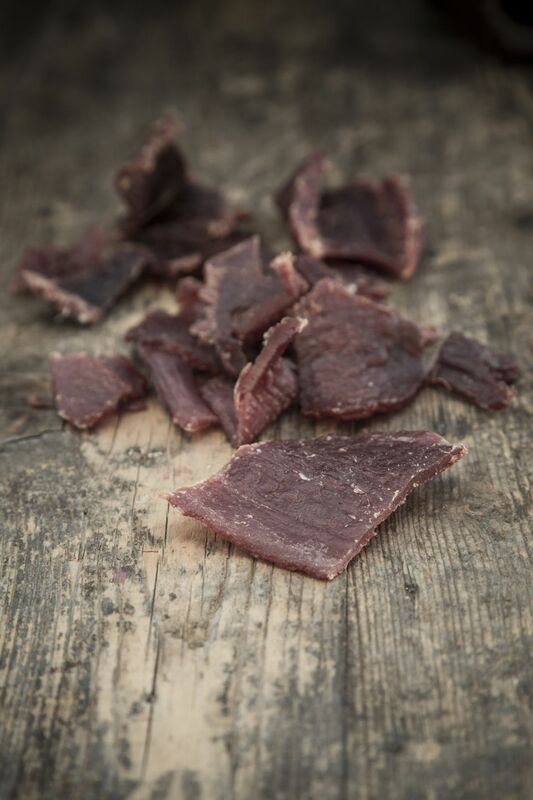 Throughout history, jerky allowed humans in a pre-electricity and pre-refrigeration world a way to store high-protein meals for long periods of time, allowing nothing to go to waste. In fact, people have made jerky from just about every kind of meat and game from Native American buffalo jerky to pioneer settlers making jerky from small, wild game and even wild turkey and goose.